administer the Plan in accordance with the Plan’s provisions. To review your claims history, claim payment status, eligibility and other enrollment information, members can access the INDECS Connection 24 hours a day, 7 days a week by clicking on the above link to the INDECS website. (Requires personal registration for HIPAA privacy and security.) You may also contact INDECS directly at 1(888) 446‐3327 to speak with a Customer Services Representative. COSTS, ALWAYS BE SURE TO USE A PPO IN‐NETWORK PROVIDER. Other administrative forms and communications. HealthCare Strategies (HCS) is a managed care company that the OU Health Plan has contracted with to assist Plan members in making informed decisions about their health care. 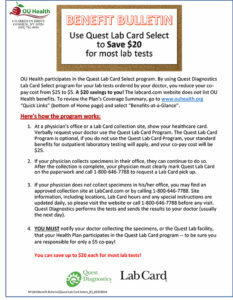 HCS is dedicated to helping the OU Health Plan members improve their health and wellness through a number of programs. HCS provides member access to Care Counselors, who are Registered Nurses, 24 hours a day, 365 days a year. They provide callers with toll-free, confidential health care advice and information. The programs are based on the premise that informed patients make better and more cost effective health care decisions. HCS provides several programs to assist members. The Medical Information Helpline (1-800-582-1535) assists members when there are questions or concerns about: medical care; side-effects’ how to locate a qualified health care provider; hospitalization is required; an outpatient procedure; a drug or alcoholic concern; or any time information or answers on medical services or procedures are needed. The HealthReach Program (1-800-582-1535) gives members personal assistance to help understand and manage specific medical conditions or minimize potential side effects of prescription drugs. The HealthReach Program does not make decisions for members but provides information and clarification to assist in making appropriate decisions. The MaterniCare Program (1-800-582-1535) is based on proactive communication with expectant mothers. Expectant mothers should call to enroll within 30 days of the diagnosis of pregnancy in order to receive the full benefit of the MaterniCare Program. The participating mother is provided a personal RN-MaterniCare Counselor who can be reached through a 24 hour information line. Customized educational information is provided to the mother throughout her pregnancy. The Large Case Management Program (1-800-582-1535) is there for members who may have a catastrophic injury or chronic care needs. The Case Counselor becomes the primary coordinator, patient advocate and counselor for the member to ensure that the member receives the best quality of care available. Remember that HealthCare Strategies Services Programs are provided without cost to members enrolled in the OU Health Plan; provide confidential & specialized information to help individuals to achieve maximum health; cannot make decisions for you; can be accessed 24 hours a day, 7 days a week. CVS Caremark provides full PBM services including network-pharmacy claims processing, home delivery (mail order), drug utilization review, formulary management, disease management, and drug data analysis services. CVS Caremark also provides a full range of injectable and infusion biopharmaceutical products directly to patients or their physicians, and provides extensive cost-management and patient-care services.